For the use with TeX/LaTeX I developped a METAFONT based font for Mxedruli and the two variants of Xucuri . You are welcome to use this font and I would be very grateful, if you sent me comments, enhancements etc or LaTeX-samples you generated with Mxedruli or Xucuri. For more information, here is the documentation distributed together with the package. the newest version of Mxedruli and Xucuri will always be here as a tar'ed and gzip'ed file (This is the Version 3.4 as of 6th April 2013). I tried to produce an rpm package mxedruli-3.4-1.noarch.rpm on a CentOS Virtual machine (without any warranty). Possibly this works on Fedora or Suse Linux as well (not texted). Also I will download the newest version to the CTAN server, as soon as I finished the final "tuning". To have a quick impression of how Mxedruli and the two variants of Xucuri look like, here is pdf file. I would appreciate any comments on this release, so please send me your comments! 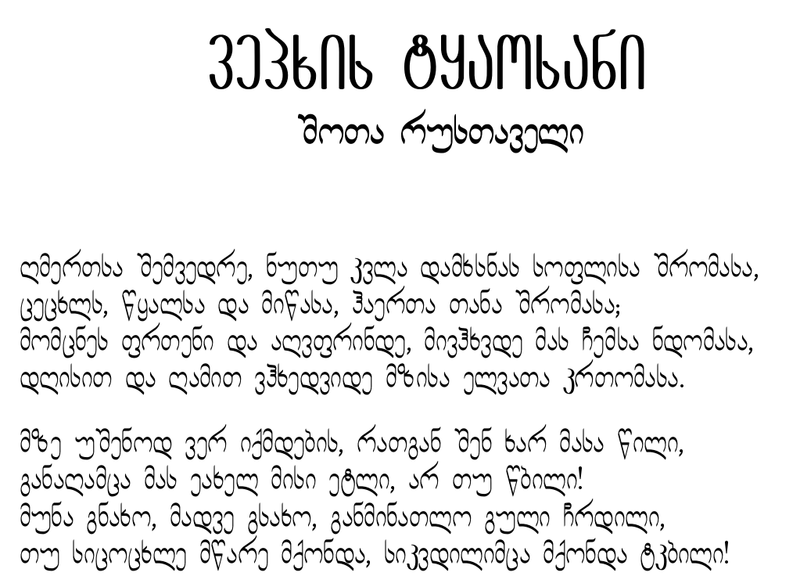 And if you are looking for a font to typeset Syriac (Aramaic), try Serto!